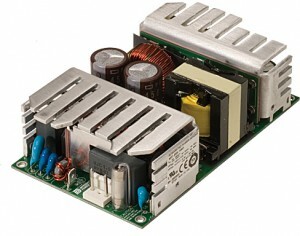 The load sharing feature of NXT series power supplies allows accurate current sharing between two or more power modules. This feature is suitable for N+1 redundant systems or high current applications where two or more power supplies need to be paralleled. Current sharing is achieved through a single wire connection (share bus) common to all of the paralleled modules. 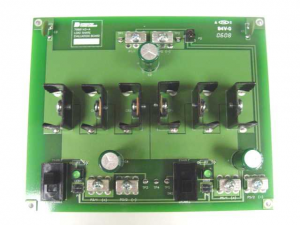 The load share evaluation board is designed to demonstrate an optimum layout to assist the user with paralleling two NXT series power supplies in computer, telecom, medical and other high reliability distributed power systems. The load share evaluation board comes pre-populated with all essential components to perform this evaluation. Dependent on configuration, there may be high voltages present on this evaluation board. Some components under maximum power may be hot and require forced air to prevent them from exceeding their maximum operating temperature. A schematic of a typical load share system, where the output current of two modules is being shared, is shown in Figure 1. Terminals P3/1 and P3/2 are connected to the +VOUT and –VOUT, respectively, of power supply #1. Pins P4/3 and P4/1 are connected to the +SENSE and –SENSE, respectively, of power supply #1. Pin P4/2 is connected to the ENABLE pin and P4/4 is connected to the SHARE BUS pin of power supply #1. Terminals P5/1 and P5/2 are connected to the +VOUT and –VOUT, respectively, of power supply #2. Pins P6/3 and P6/1 are connected to the +SENSE and –SENSE, respectively, of power supply #2. Pin P6/2 is connected to the ENABLE pin and P6/4 is connected to the SHARE BUS pin of power supply #2. Terminals P1/1 and P1/2 are the system output +VOUT and –VOUT, respectively. The evaluation board is shipped with jumpers connecting P2/4 and P2/3 (+ SYSTEM OUTPUT and SYSTEM SENSE) and P2/2 and P2/1 (- SYSTEM OUTPUT and SYSTEM SENSE) providing local sense at the evaluation board outputs. If remote sense is desired at the load, these jumpers may be removed and P2/3 and P2/1 connected to +VOUT and –VOUT, respectively, at the load. Improperly connected sense leads may damage the power supply and / or load share evaluation board. With the modules output voltage adjusted to their factory settings and the evaluation board connected to the two modules as indicated above, power may be applied to both modules and the current will be shared equally between the two modules. Test points have been provided to monitor the output voltage of each module as well as the output voltage of the evaluation board. Current probes may be used to examine the current sharing between modules. This feature may be used to introduce a module into a load share system. In a typical application, the switch is set to the DISABLE position, a module is connected to the system, powered on and the switch moved to the ENABLE position. 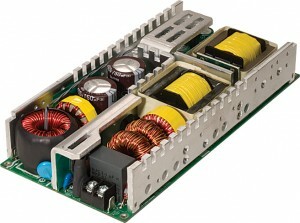 This module will now share load current equally with the other modules in the system. However, the module must be configured as the slave (lower VOUT than the master) for the disable to occur. Oring diodes must be used in all applications with the 2.5 through 15 Volt models (1001 – 1005) to avoid one module from sinking current from the other. The Oring diodes are optional with 24 through 48 Volts models (1006 – 1008) in power boosting applications. They must be used to isolate the modules in the event of a failure in redundant applications. Current carrying conductors must be short and symmetrical. Remote sense conductors should use a twisted pair. Minimum current share load is 10% of each modules output current rating. Maximum output voltage deviation between modules is 5% when using 2.5 through 5 Volt models. Maximum output voltage deviation is 400 mV when using 12 through 48 Volt models. Oring diodes with a very low forward voltage drop must be used to reduce power dissipation. Oring diode power dissipation must be subtracted from the power rating of the power supply. Up to four modules may be paralleled with the use of an additional evaluation board. Load regulation, output noise, and transient response may be higher than specified in load sharing applications. 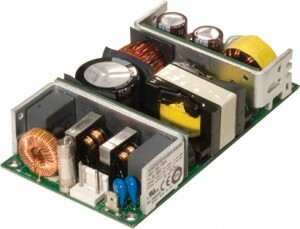 NXT series power supplies have a remote inhibit option that may be used as a load share enable/ disable. 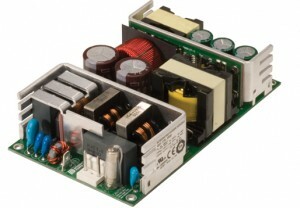 Load share evaluation boards require the same forced air rating as the power supply model being used. 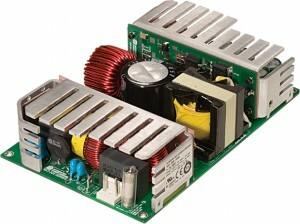 Individual power supplies are shipped pre-configured for local sense. These jumpers must be removed prior to connection to the evaluation board. 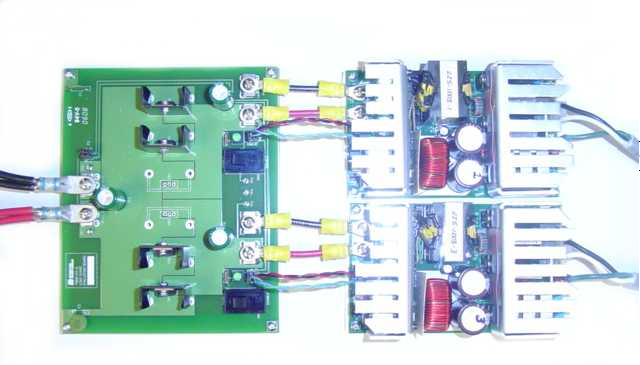 A typical load share system using two NXT-175-1003 power supplies is shown in Figure 3.